LITTLE ROCK, Ark. (AP) — More than seven months after residents first noticed a fire at an illegal dumping site in northwest Arkansas, it’s still smoldering, sending noxious smoke throughout the town and seeping into homes, with costs to extinguish the fire estimated at tens of millions of dollars. Chris Nelson, 40, lives with his wife and 4-year-old son in a house that’s a little more than 1000 feet (305 meters) from the shuttered dumping site. He said his family has experienced a persistent cough since the blaze started, his wife has been diagnosed with bronchitis and his son has been on multiple rounds of antibiotics. 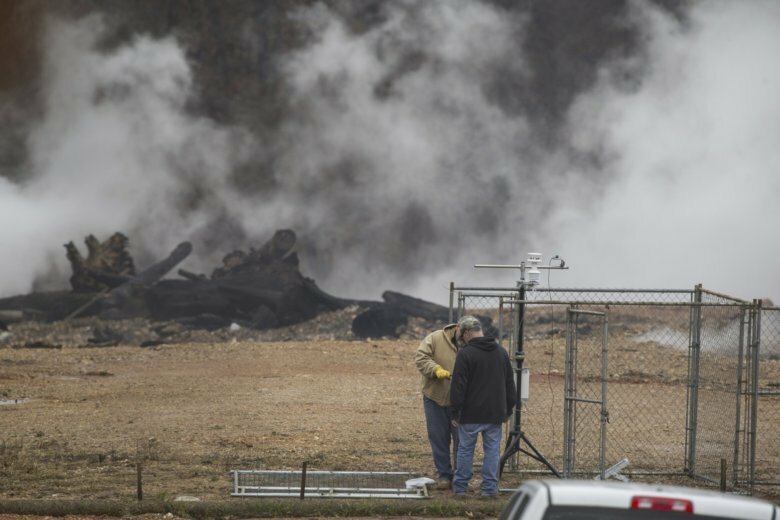 The fire burning at least 70 feet (21 meters) underground in this community of about 28,500 people some 170 miles (2.74 kilometers) northwest of Little Rock has raised questions about how and why the dump operated without a state license for several years. No one is sure how the underground fire started at the illegal dumping site in the northwest Arkansas community of Bella Vista, though city officials suspect a small brush fire ignited debris below ground. At least two lawsuits have been filed against former and current owners of the 4.75-acre (1.9-hectare) plot of land, as well as the Bella Vista Property Owners Association, which shuttered the dump in 2016 before the owner sold it to a tree trimming and disposal service early last year. The association began leasing the site in January 2004 from the storage company that owned it. The association allowed residents to dispose of brush, wood and other organic materials in it. The state says the site never should have been operating as a dump of any kind. But state inspectors and contractors say it’s clear non-organic items such as car batteries, wiring, swimming pool liners were dumped there at some point, complicating efforts to put out the blaze and clean up the mess. The original owners and the current owners did not return messages for comment. The Bella Vista Property Owners Association declined to answer questions about legality of the site. After the association closed the dump in 2016, it was capped with soil and vegetation, said Kim Carlson, director of marketing for the association. The Arkansas Department of Environmental Quality said it could not answer questions about why the dump stayed open after an inspector went to the site in 2008 in response to a complaint that cement mixer drums from Bella Vista’s developer had been dumped there. The mixers were removed, according to local news reports. Last July, residents began to notice what they thought was a brush fire and reported the smoke to the state. Inspectors visited the site in early August and the Department of Environmental Quality sent warning letters to the current and former owners. But the state and federal government didn’t start monitoring air quality until November, after frustrated residents began to complain of respiratory problems and fears of decreased property values. Kelly Strain, 56, lives less than 800 feet (244 meters) from the edge of the shuttered dumping site. He said the fire initially produced smoke that smelled like wood burning in a campfire. But within a few months, that changed. State officials and contractors in January began preparation for cleanup. Extinguishing the blaze is more complicated than just dumping water on it, said department spokeswoman Donnally Davis. Air pockets and various vents are interspersed between layers of dumped material compacted under dirt and more waste. Even flooding the site could leave small fires burning. Plus runoff could contaminate a nearby lake or seep into the groundwater. The exact cost to put out the fire and get rid of the waste is unknown. Davis said estimates so far have ranged from $15 million to $37 million. State lawmakers are considering a $20 million appropriation to help. State Sen. Jim Hendren, a Republican whose district includes Bella Vista, said he anticipates the bill will “move fairly quickly” through the Legislature. Meanwhile, residents are growing weary.